The Duke of Sussex has arrived in Zambia for a two-day solo visit. During his 48-hour trip, he will attend a commemoration of Zambian military veterans, and meet officials, social workers and young entrepreneurs. 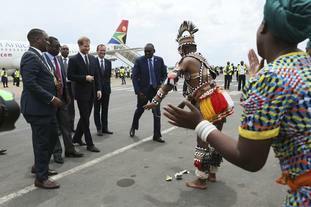 The prince was welcomed as he stepped off the plane in the Zambian capital Lusaka on Monday by nine-year-old Jane Chawanangwa and traditional dancers. The duke later planned to attend a reception celebrating ties between Britain and Zambia. Harry’s schedule on Tuesday includes a visit to a military barracks and an event of the Queen’s Commonwealth Trust, which supports the social work of young people worldwide, and of which he is president. Harry will also visit Circus Zambia, which provides educational and job opportunities to young people, and BongoHive, a Zambian technology and innovation centre that helps entrepreneurs.